The following information showcases recent news and announcements about programs, physicians, events and medical breakthroughs at Northwestern Medical Group. If you are currently using RelayHealth or athenahealth, your patient portal has changed to NM MyChart. 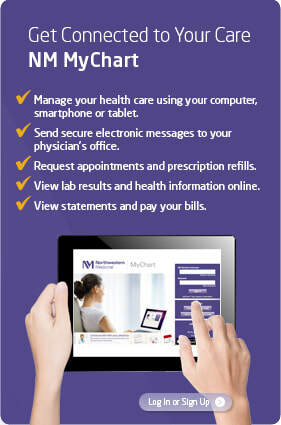 Sign up for NM MyChart to communicate with your care team online using your computer, smartphone, or tablet. NOTE: If you are a new NM MyChart user, some features may not be available to you until after your first appointment. Click here to learn more.